Okra is one of those vegetables you either love or hate. In my family, we have both lovers and haters. The texture of okra is what usually gets it into trouble…it’s, well…slimy, and there’s not much you can do about it. Those of us who love it, like to eat it fried, stewed, added to gumbo and probably most of all, pickled! Because it’s pickled whole, it doesn’t really get slimy. It has a firm crisp texture and is just as good, if not better than regular cucumber pickles. If you grow okra, make sure to pick it every other day, while it’s young and tender. The pods should be no more than 3 to 4 inches long. Larger, mature pods are extremely tough and woody – they can’t be eaten. If you’re buying okra, look for a bright green color with no black spots. Make sure the pods are firm and not limp. Okra does not really store well, so make sure that you are going to use it within a couple of days. Store in an open paper bag in the warmest part of the refrigerator; temperatures below 45 degrees can damage okra. Do not wash okra until you’re ready to use it, or it will become slimy. And speaking of SLIME…remember: the more it’s cut, the slimier it will become. By the way, everyone in my family loves pickled okra…even the haters! Quinton and the kids were eating them as fast as I could make them! I’m down to only two jars! Next year, I’ll have to start rationing! Wash okra with cold water and place on paper towels to drain. Prepare 6 pint jars for canning. Pack rinsed okra, stems up, into clean jars. Add 1 or more halved fresh peppers to each jar, according to taste, with 1 clove of minced garlic, per jar. (I usually squeeze mine through my pampered chef garlic press). Add one sprig of dill to each jar. Bring remaining ingredients to a boil. Pour over okra, filling to within ¼ inch of the jar top. Run a butter knife down between the okra and jar to remove any air bubbles and to make sure the liquid is covering everything completely. Wipe off rims of filled jars with a clean damp kitchen towel, then firmly screw on lids with screw bands. Place sealed jars in canner or pot and add enough hot water to cover by 2 inches. Bring to a boil, covered. Boil, covered for 10 minutes, then transfer jars with jar tongs to a towel-lined surface to cool. Jars will seal (you will hear pings, which indicate that the jars are sealed. You will notice that the lid is concave). After jars have cooled, for 24 hours, press center of each lid to check if it’s concave. If it goes back and forth, then the lid did not seal and the contents need to be refrigerated and eaten within a week. 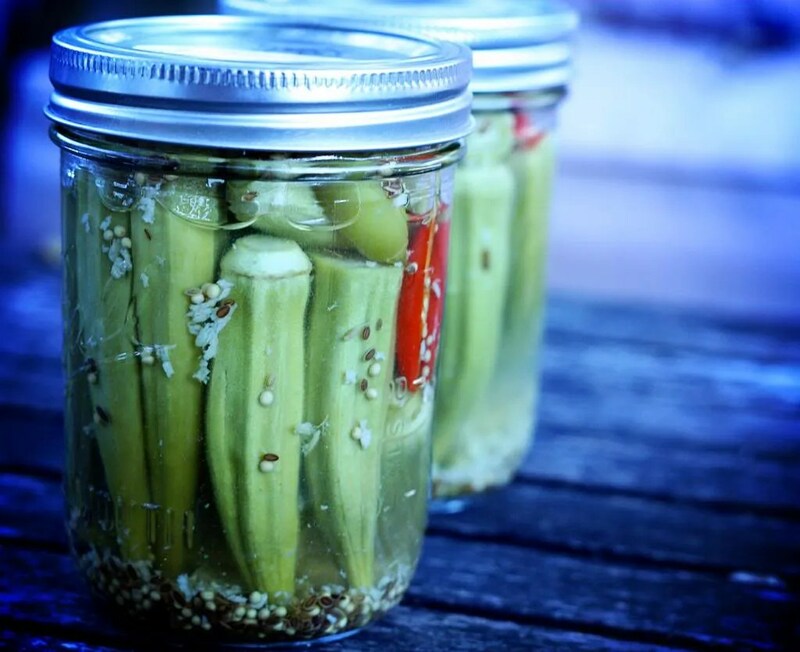 Let pickled okra stand in jars at least 1 week before eating.